Many word search puzzle books detail the ethereal benefits of the mental exercise involved in solving word or letter puzzles. These books also describe the obvious methodology where the solver finds words (or in this case, words and phrases) side to side; forward/backward; or, diagonally. Crossing off the words or phrases helps the solver detail the success of his task. Our purpose is to cleverly and effectively detail the more egregious quotations and actions of the current occupant of the White House. This book is unique from the usual seeking of the genus or species of the Etruscan rootworm or the aboriginal scab camel. 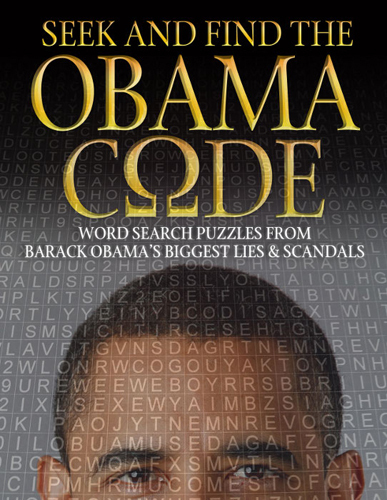 May this puzzle book help alleviate the boredom of a waiting room or commercial breaks or struggling to listen to the drive-by media propaganda ministry while, at the same time, revealing more of our "historic leader" and his road to socialism. We understand that a Prague newspaper printed the following: "The danger to America is not Barack Obama, but a citizenry capable of entrusting a man like him with the presidency. It will be far easier to limit and undo the follies of an Obama Presidency than to restore the necessary common sense and good judgment to a depraved electorate willing to have such a man for their President. The problem is much deeper and far more serious than Mr. Obama, who is a mere symptom of what ails America. Blaming the prince of the fools should not blind anyone to the vast confederacy of fools that made him their prince. The republic can survive a Barack Obama, who is, after all, merely a fool. It is less likely to survive a multitude of fools, such as those who made him their President."